After 24,000 hours and 30 years flying aerobatics in air shows you would think Sean Tucker has learned everything there is to know. He’s world famous, an honorary Thunderbird and Blue Angel who is the only civilian pilot who has ever been authorized to and fly in close formation with both demonstration teams. 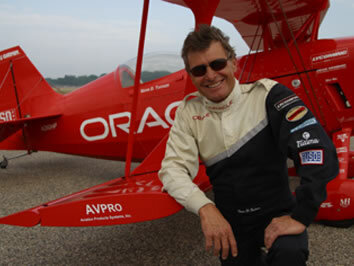 He remains devoted to training and expects it will take 2,000 flights to master his new plane. Sean D. Tucker, legendary airshow performer, this summer is introducing his brand-new custom-built Challenger III biplane, which can perform extreme maneuvers beyond what Tucker’s previous aircraft were capable of. With the faster, more dynamic airplane, designed by Steve Wolf, Tucker has added more maneuvers to his routine, including somersaults and multiple cartwheels, and there is more to come. “I still have so much to learn,” Tucker told AVweb this week. “It’s like learning to fly all over again. It’s so much fun.” He has flown the airplane only about 200 times so far, he said, and “maybe with about 2,000 flights” he’ll have a handle on its full range of capabilities. He said it’s about a “30-percent better” airplane than any other he’s flown. The biplane features a carbon-fiber flying tail inspired by the tails used on remote-control model aircraft, and eight ailerons. Because of the new airplane’s cockpit design, Tucker said the G forces are less debilitating and he can practice four times a day instead of two. Still learning after all these years? That’s why he’s the best. Bob Hoover said, if you can fly well upside down you’re twice the pilot. I can’t say that’s true but it does make you a better aviator, a safer aviator. And it’s a blast. This entry was posted in Aerobatics. Bookmark the permalink.